Hollywood Gothique's plan to deliver a Halloween Haunt Odyssey Tour of Thousand Oaks and Simi Valley was thwarted by a string of circumstances beyond our control, abetted by bad scheduling on part. Instead, we are offering this recommended itinerary of Simi Valley Yard Haunts, based on past experience with the haunts in question. We are organizing the Simi Valley haunts via location, from east to west, working on the presumption that most Los Angeles readers would be heading in that direction. 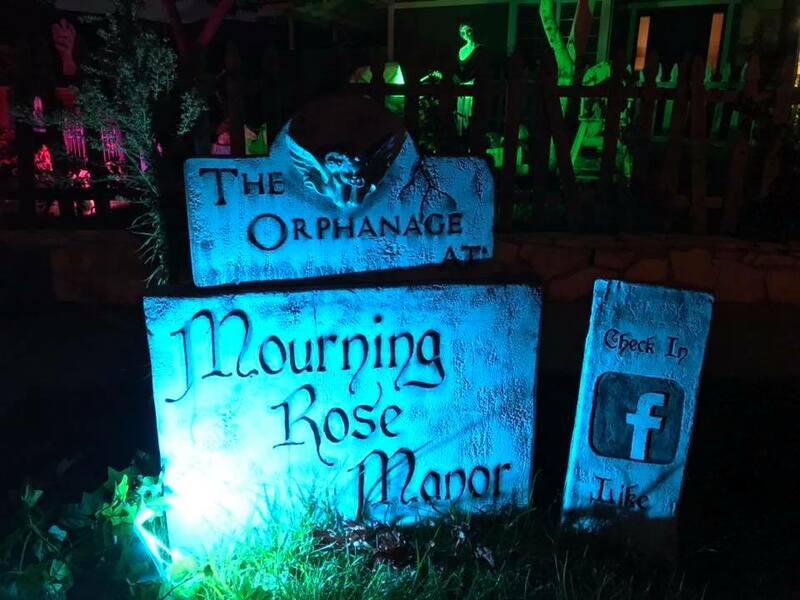 Mourning Rose Manor has always presented an absorbing Halloween display. In the past, the scenery suggested a cemetery in the front yard, attached to the manor. This year the theme has changed to an orphanage. Apparently, there is a story behind the transition, and it does not paint the orphans in a charitable light. We drove by this one, but the lights were off. There are, however, a few other lighted houses up and down the street, indicating this is a good neighborhood for trick-or-treating. We know nothing about this yard haunt except that it is a display, not a maze. It lies almost midway between Mourning Rose Manor and The Haunt at Helizondo, so it's only a short detour north of the 118 Freeway. If you're in the area, check it out and let us know what it's like. Drinks on the House at Hellizondo! 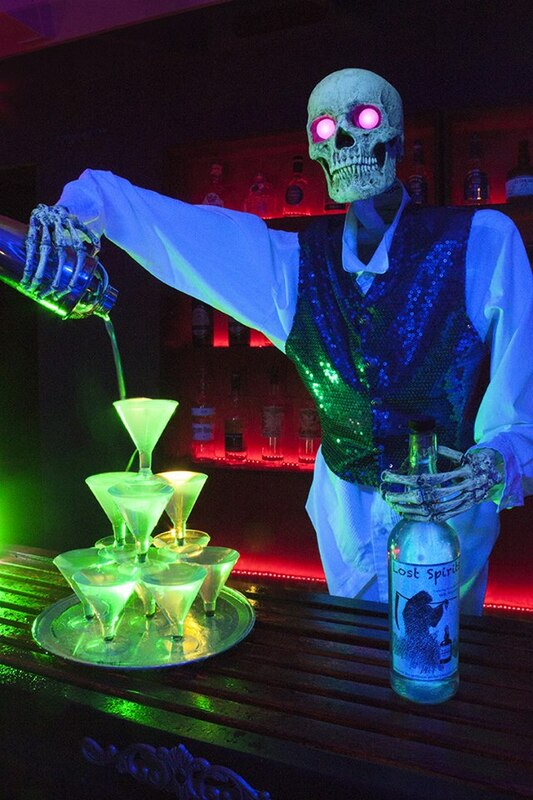 This Halloween's theme is a prohibition-era speak-easy of the dead, with glow-in-the-dark skeletons lounging at tables and serving drinks at the bar, bathed in eerie black light. The maze was closed by the time we reached it, but the settings, which occupy the front yard and part of the driveway, are impressive. 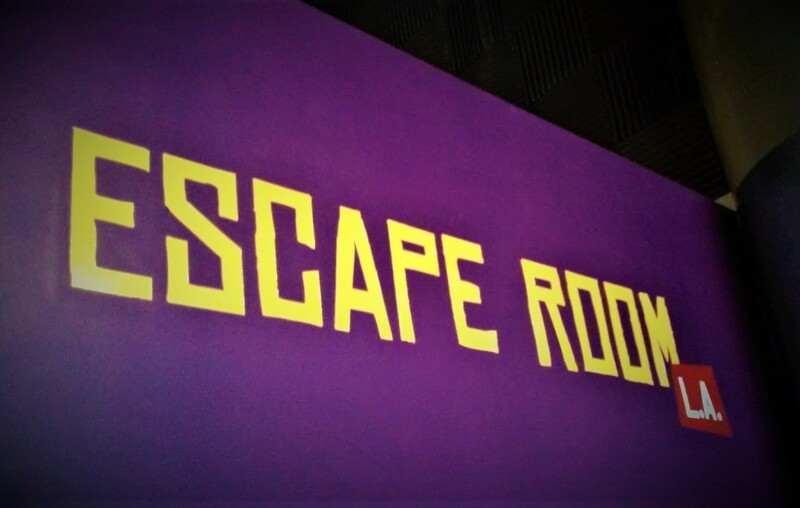 We did a walk-through of the maze, which had us kicking ourselves for not arriving in time to see things in full operation, with haunt-actors in place. We have only experience the Haunt at Helizondo a few times, but it has always been worth the drive to Simi Valley. If we can find a way to get there tonight, we will. 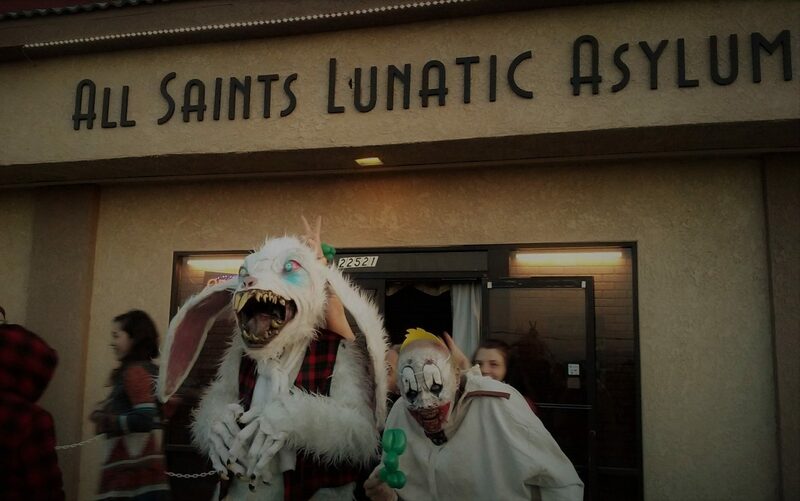 A former home haunt, 13th Gate Asylum was has on hiatus the past few years. For Halloween 2018, it has gone pro, teaming with the Rotary Club of Simi Sunrise to raise fund for charity, with a new haunt titled Voodoo on the Bayou. We never visited 13th Gate Asylum at its previous location, but it has a strong reputation which we would like to sample for ourselves. Total drive time for these haunts (not including time to reach Simi Valley) is 22 minutes according to Google Maps. We suggest starting with the home haunts, which close first, and winding up with Voodoo on the Bayou, which stays open an hour later. You can find the route on Google Maps here. If you have time left over (unlikely), you can head southwest to Thousand Oaks for the Reign of Terror Haunted House and Murder House Productions. Good luck!